Selestial's MyGreenFills makes laundry a cinch by shipping detergent straight to your door whenever you need it. 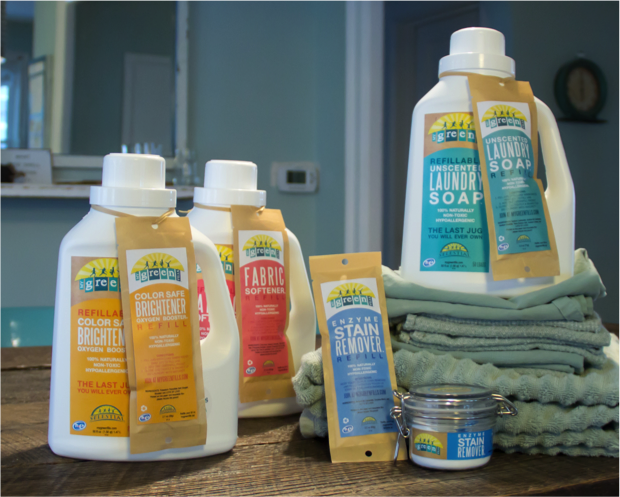 You don't have to go get any, you don't have to use new plastic bottles every time you run out, and you don't have to worry about the ingredients in the soap! Selestial works by a refill system. You get a packet that you add to the jug you get when you first sign up, and then mix with water. Not only is it eco-friendly because of what's in it (and what's not), but it's a great way to nearly eliminate the packaging involved. 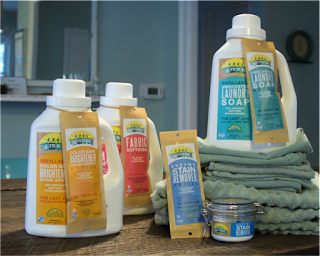 The soap is non-toxic, hypoallergenic, and effective in cold water and HE washers. It costs less than 12 cents per load, and the line comes with all the laundry care products you'd need: detergent, color safe brighteners, fabric softener, and stain remover. It's effective too - just as effective as any detergents I've ever tried previously! Right now if you sign up at MyGreenFills you can get a free jug (plus $5.83 shipping and handling, which is a steal compared to how much detergent you'll get in the first shipment alone).